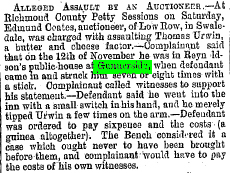 ALLEGED ASSAULT BY AN AUCTIONEER.—At Richmond County Petty Sessions on Saturday, Edmund Coates, auctioneer, of Low Row, in Swaledale, was charged with assaulting Thomas Urwin, a butter and cheese factor.—Complainant said that on the 12th of November he was in Reynoldson's public-house at Gunnerside, when defendant struck him seven or eight times with a stick. Complainant called witnesses to support his statement.—Defendant said he went into the inn with a small switch in his hand, and he merely tipped Urwin a few times on the arm.—Defendant was ordered to pay sixpence and the costs (a guinea altogether). The Bench considered it a case which never ought to have been brought before them, and complainant would have to pay the costs of his own witnesses.